Malvales sunt ordo plantarum florentium, qui, ut a systemate APG II circumscriptus, circa 6000 specierum intra novem familias comprehendit. Ordo inter eurosidas II ponitur, quae sunt pars eudicotylendonum. Hae plantae plerumque sunt frutices et arbores; pluribus ex suis familiae sunt distributio cosmopolita in regionibus tropicis et subtropicis, et distributio circumscripta in regionibus temperatis. Distributio inusitata Madagascaria invenitur, ubi tres familiae endemicae (Sphaerosepalaceae, Sarcolaenaceae, Diegodendraceae) fiunt. Multae Malvacearum species sensu lato ob lignum adnoscuntur, quarum materia Ochromae pro levitate, et materia Tiliae pro sculptura nota est. Fructus Theobromae cacao ut pars socolatae adhibentur. Genus Cola alta caffeini summa innotuit, et olim ad faciendas varias potiones colatas late adhibebatur. Aliae Malvalium plantae notissimae sensu APG II sunt daphne, hibisci, alceae, abelmoschi (vide Abelmoschus esculentus), adansoniae, gossypium, et ceiba. Morphologia Malvalium est diversa, paucis proprietatibus communibus praedita. Inter quas plerumque inventas sunt folia palmata, sepala connata, et certa structura et chemica seminum compositio. Cortex saepe est fibrosus, stratis phloematis mollis structus. Fines et circumscriptiones familiarum nuclearium Malvalium (Malvaceae, Bombacaceae, Tiliaceae, Sterculiaceae), diu fuerunt difficile. Arta inter has familias coniunctio, praecipue inter Malvaceas et Bombacaceas, generatim agnoscitur, quamquam plurima classificationis systemata eas ut familias separatas usque ad praesens tractaverunt. Quia autem multae phylogeniae moleculares nunc probant Sterculiaceas, Bombacaceas, et Tiliaceas usitate definitas esse vel paraphyleticas vel polyphyleticas, magis magisque consentaneum est expandere Malvacias ut ordo has familias tres amplectantur. Haec amplificata Malvacearum circumscriptio in recentissima systematis Thornensis editione, in systemate Angiospermarum Phylogeniae Gregis, et in recentissima tractatione late patente systematis Kubitzkiensis familiarum et generum plantarum vascularium agnita est. Familia in systemate APG II regnans est Malvaceae amplificatae (Malvaceae sensu lato), quibus sunt plus quam 4000 specierum; tum Thymelaeaceae, quibus sunt 750 species. Haec aucta Malvacearum circumscriptio familias Bobmacacearum, Sterculiacearum, et Tiliacearum comprehendere habetur. Sub vetustiore systemate Cronquistiano, ordo has quattuor familias comprehendit, Malvales nucleares appellatas, atque Elaeocarpaceas, etiam in Dilleniidis positus. Nonnullae familiae nunc a Cronquist comprehensae in Violalibus positae sunt. ↑ Angiosperm Phylogeny Group (2009). "An update of the Angiosperm Phylogeny Group classification for the orders and families of flowering plants: APG III" (PDF). Botanical Journal of the Linnean Society 161 (2): 105–121 . ↑ Daniel L. Nickrent, "Cytinaceae are sister to Muntingiaceae (Malvales)," Taxon 56 (4):1129–1135 (2007) (abstractum). ↑ Bayer et Kubitzki 2003:225–311. Alverson, W. S., K. G. Karol, D. A. Baum, M. W. Chase, S. M. Swensen, R. McCourt, et K. J. Sytsma. 1998. Circumscription of the Malvales and relationships to other Rosidae: Evidence from rbcL sequence data. American Journal of Botany 85:876–887. Abstractum. Bayer, C., et K. Kubitzki. 2003., Malvaceae. In Malvales, Capparales and Non-Betalain Caryophyllales, 225–311. The Families and Genera of Vascular Plants, ed. K. Kubitzki, 5. Edlin, H. L. 1935. A Critical Revision of Certain Taxonomic Groups of the Malvales. New Phytologist 34:1–20, 122–143. Judd, W. S., C. S. Campbell, E. A. Kellogg, P. F. Stevens, et M. J. Donoghue. 2002. Plant Systematics: A Phylogenetic Approach. Ed. 2a. Sunderlandiae Massachusettae: Sinauer Associates. ISBN 0878934030. Kubitzki, K., et M. W. Chase. 2003. Introduction to Malvales. In The Families and Genera of Vascular Plants, vol. 5, Malvales, Capparales and Non-Bbetalain Caryophyllales, ed. K. Kubitzki, 12–16. du Mortier, B. C. J. 1829. Analyse des Familles de Plantes, avec l'indication des principaux genres qui s'y rattachent. Tornaci: Imprimerie de J. Casterman. Whitlock, B. A. 2001. 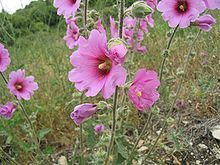 Malvales (Mallow). In Nature Encyclopedia of Life Sciences. Londinii: Nature Publishing Group. DOI. Vicimedia Communia plura habent quae ad Malvales spectant. Novissima mutatio die 11 Februarii 2018 hora 18:24 facta.